This lesson is presented by multitalented Hawaiian musician, Daniel Ho. Ho is immensely popular as a ukulelist, guitarist, drummer, keyboardist, composer, arranger, and producer. His music is characterized by soothing melodies and harmonies that are underpinned by a sharp rhythm and theory-based arrangements. 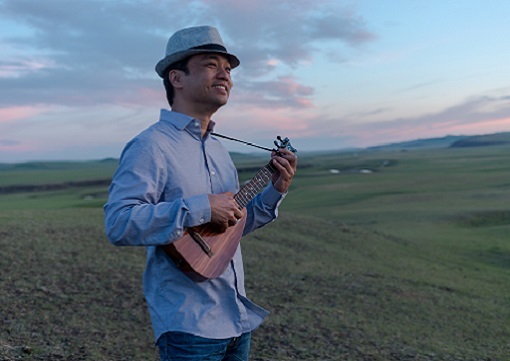 In “Daniel Ho Ukulele World”, he will teach the ukulele – one of his many means of musical expressions – and delve into why the ukulele has the ability to touch the hearts of so many. In addition to ukulele techniques, he will teach improvisation, basic knowledge on ukulele as an instrument, as well as music theory such as scales and chords. He is also a six-time Grammy Award Winner for Best Hawaiian Music Album. We hope you enjoy “Daniel Ho Ukulele World”. Lesson 21 : Etude "8 by 8"
Introductory Campaign "Ukulele World <1 month> + 1 Feedback Session"
All 28 lessons are available to stream for 1 month. 1 Feedback Session ticket would be delivered to your "My Course" within 3 days after you joined this course. All 28 lessons are available to stream for 12 months. All 28 lessons are available to stream for 6 months. All 28 lessons are available to stream for 3 months. All 28 lessons are available to stream for 1 months. 1 Feedback Session ticket would be delivered to your "My Course" within 3 days after you joined this couse.